Russian President Vladimir Putin has said that a “terrorist war” is being unleashed against true followers of Islam. Religious radicals in Russia will fail in their attempts to intimidate clerics and followers of traditional Islam, President Putin said on Wednesday. Putin said that “multiethnic harmony should be consistently maintained” as “religious radicals…of various confessions” have intensified their activities in the country. “In fact, a terrorist war is being waged against [those who teach] traditional Islam. They are being intimidated, deprived of their rights to speak to believers. “At the same time, false values that have nothing to do with the traditional Islam are being imposed on people,” said Putin. He was speaking at a meeting with his envoys to Russian federal districts. Representatives of Russia’s Muslim community expressed their concern late last year over the safety of clerics in the North Caucasus following a number of attacks. According to findings from Pew Research, Russia has the largest Muslim population in absolute numbers in the whole of Europe. 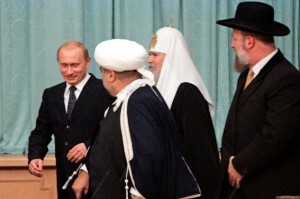 The number of Muslims in Russia is projected to increase from about 16.4 million in 2010 to about 18.6 million in 2030. The Muslim share of the country’s population is expected to increase from 11.7 per cent in 2010 to 14.4 per cent in 2030. “As far as intimidation is concerned, I’m sure that those who are trying to do it will fail completely… Such people cannot be intimidated. But they evidently need our support and help, and this support should be efficient,” Putin said. A number of moderate Muslim scholars have been killed in Russia in the past years, including Dagestani Muslim theology professor Maksud Sadikov and influential Sufi cleric Sheikh Said Afandi, North Ossetia’s deputy mufti Ibragim Dudarov, deputy chairman of the Muslim Board of Karachayevo-Circassia and Stavropol Ismail Bostanov. In July 2012, the head mufti in Russia’s Volga republic of Tatarstan, Ildus Faizov, was injured in a car bomb attack, hours after his former deputy was shot dead. Commenting on the attack, an Islam expert at the Carnegie Moscow Center, Alexey Malashenko, said the radical Islam, or Salafism, has apparently started spreading even beyond its conventional borders in the North Caucasus.